We were all sitting around the able eating diner, me my 3 sisters, my brother and my parents when suddenly someone knocked on our front door. My mum, who was sick opened up, i heard from the table 2 men, they were talking to my mum, who was clearly afraid. Then my sister came to me, she told me to come with her. I trusted my sister and we went to her room. She opened up her small wooden closet and said to me: “Go and sit here with me, Alex, trust me”. I did and we went inside. We were there and suddenly we heard gunshots. Three, to be precise. I was scared and would’ve started crying if my sister wasn’t there. I heard my dad yelling something to the two men. The men replied: “We will kill you as well, but we will do it differently”. I heard the two men beating up my father and slowly killing him, while he was forced to watch them, doing all sorts of terrible tings to my mum. It was a few days later when my sister woke me up,telling me it was safe. I saw blood everywhere and started crying. My sister said that we needed to go and i followed her. We started running away from the city towards the west. It was a few days later when we met an old couple. They asked us what we were doing and my sister explained. The man said to us that they would help us. They said that their dougher wanted kids but wasn’t able to. The man said that we should come with her to America. America, a place i only knew because of books. We were now so close to. We followed the old couple to a better place. We were already a two years in America with our new “mum”. She was such a nice person and made us feel like we were at home. But i missed home, at home where my friends and i hadn’t really adapted to this culture. I had one real friend in school, Dave. We were best friends and did everything together. Then Dave came to me and said. “I have three tickets for the game tonight but my grandpa can’t come, do you want to come”. I told him that i loved to. I wasn’t really sure which game he was talking about, but i was up for it. Later it worked out to be a game of DC United, the local soccerclub. I never really watched soccer before so this was without a doubt something new for me. DC United managed to grab a 2-1 victory, but this was the day i started loving the game. The next few years i went to every home game of DC United with Dave. Every game was an unreal experience even if we lost. I was working now 40 hours every week and happy with my life. I was married, had one daughter, Anna. Then i got suddenly a call. It was the same instructor i had 12 years ago. He said to me that he wanted me to come and try the class again. I came to him and took the test again. Unfortunately, it had the same result: FAIL. I wasn’t happy about the result but let it go then he came to me and said, don’t you worry. You don’t have to have any diploma to become a manager. That i’m able to do it even without my certification. Jesus Christ, this is a very crazy start. Everyone seems to be infected by Michael. I was searching for a job for 4 months now, had job interviews in Croatia, Russia, Japan, China and Belgium, but none of them worked out. I was on the edge of giving up, when i got a call from Fawzi Al-Bashsa, chairman of Al-Khaleej in Suadi-Arabia. 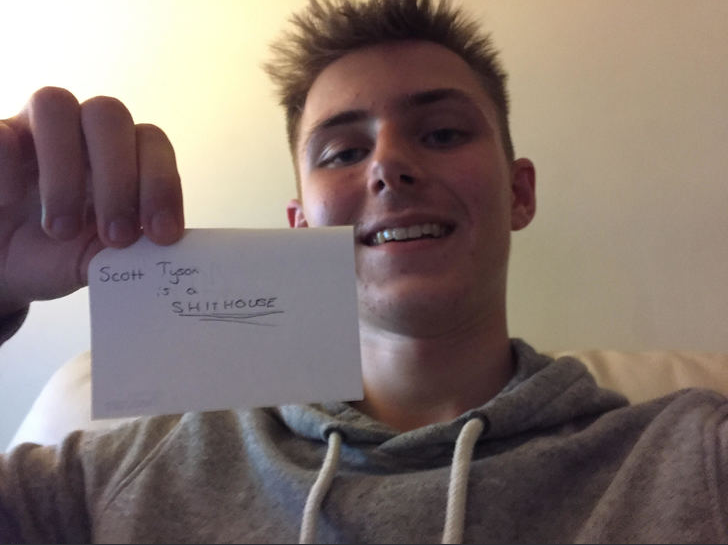 He asked me to ateend a job interview in his office, which i happily accepted. I decided to get some background information of the club before going to the interview. It was Al-Bashsa, asking me if i could come immediately to his office. I rushed my way to the hotel where i saw a very happy chairman. 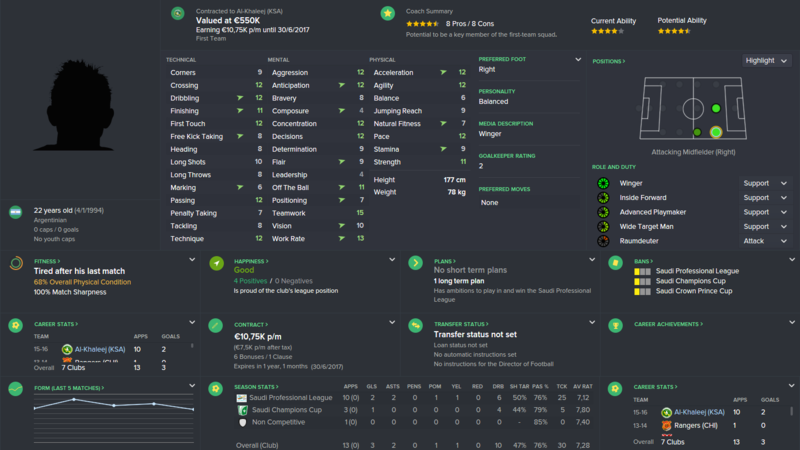 He told me that after reviewing all candidates he wants me as manager and offered me my contract, which i accepted. This was it, my first game as manager and it couldn’t be at a better place. King Fahd International Stadium, such a beautiful place. But i wasn’t here as a tourist just looking at the beautiful structure. I was here to try and lead Al-Khaleej to a victory. It was very tuff tob e starting my career here, away, against Al-Nassr. Al-Nassr is one of the best clubs in the league andis showing that they are this year. We on the other hand weren’t so strong, the team hasn’t won for a pretty long time ad not confident. I gave the players a few final instruction and tried to motivate them for the match. I was loving life, managing in this kind of stadium, when i suddenly heard all people cheering. When i looked up i saw that we were one behind. Not even one minute as manager i was able to not concede. I tried to keep focused and kept giving instructions tot he team. It worked as we were able to make the 1-1 after 9 minutes, when Marwan Hussein scored after a fast counter. We were being dominated, as expected. Al-Nassr kept pressure and we were limited in our options. But even with a dominating Al-Nassr we were able to survive until the half-time whistle. I told my players i was happy with the result and that i expect more. The players started to get their believe back, finally. The players started playing way better in the 2nd half and Al-Nassr was getting less chances. Unfortunately it took 82 minutes for Al-Nassr to make the 2-1, by a header from Gabriel Marquinhos. We tried afterwards, but without success. 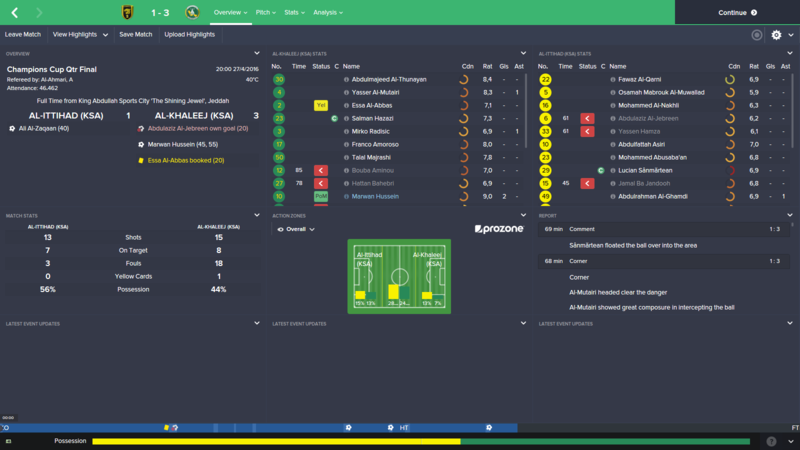 That was my first game as manager, losing 2-1 away at Al-Nassr was not a bad result, but not what i was hoping for. It was obvious, we need to do a lot if we want to stay up in the Saudi Professional League. Tough loss but from what I know Al-Nassr is a really good club. Hope you can bounce back in the next few matches. After the Al-Nassr resulted we needed to bounce back. We tried to make our moral better. We played two friendly to get back to winning ways which we did. After the friendlies we played Al-Faisaly. Al-Faisaly was 10th at the time and wanted to keep the gap between themseleves and the relegationzone. In a poor game the score was opened in the 75th minute by an own goal and not even a minute later it was 2-0. The Najran game was once again poor from us. Playing the same system as the Al-Faisaly game worked defensively decent but was in the attack poor. We weren’t able to break the defence from Najran a lot and when we did, we weren’t able to score. Al-Wehda was from all of them the most important game. A win would get us up in 11th and a loss would mean that the gap between us and 11th would be 5 points. We managed to get a 1-0 lead just before half time. After 74 minutes Al-Wehda got a deserved equalizer. They weren’t able to keep this score as Al-Shaikh managed to get this second game-winner in this month. Al-Ittihad was favorites fort he game, but lost by 4-1 the game before. The game started out great for us when we were able to score after 2 minutes. Al-Ittihad dominated the game after this and were looking fort he 1-1. They got the goal after 35 minutes, when we weren’t able to clear the ball out of the box. Al-Ittihad kept dominating, looking fort he winning goal, but didn’t get it. A very decnt 1-1 away at home. Al-Fateh was another very imortant game. Al-Fateh were 9th with a 5 point gap on us. We needed to try and win this one to make the gap smaller. In a very dull game it was Mohamed Al-Rashed to score the only goal. Both team created little to no chances and deserved no winner. 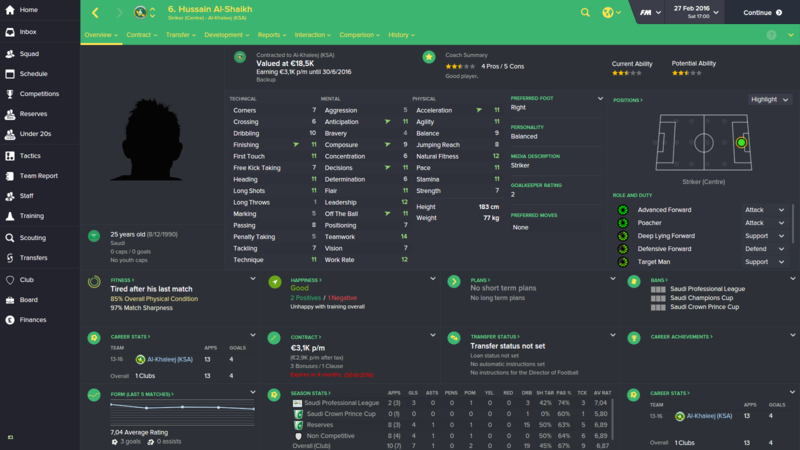 Al-Shaikh managed to get PoTM scoring 2 goals from 3 game in which he all played as substitute. He managed to get the 2-0 against Al-Faisaly and the 2-1 against Al-Wehda. Hopefully you can get some wins to just pull yourself away. The compitition had 6 more games. Qualification fort he Asian Champions League wasn’t possible anymore (via the competition). We were still pretty close tot he relegation zone. We needed to try and extend the 7 point gap in these remaining matches. We played 2 times at home and 4 time away. Both home games were against tough opponents and our away games were against easier sides except the game against Al-Hilal. The first game was a must win game against bottom of the league Al-Ra’ed. We were poor on the night but were still better then our opponents and got finally our first away win. Al-Shabab were our second opponents. The number 4 was able to put pressure on fort he complete game, but incredible saves of our goalkeeper saved us 1 point. 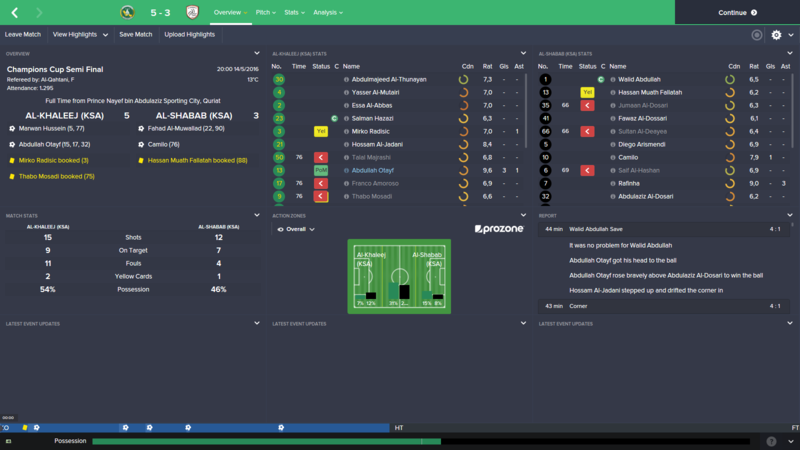 A pretty hard game away at home against Al-Qadisiyah who were having an insane season. Going 2-0 behind inside 20 minutes was not good at all. Going with the same result into halftime things needed to change. We had to try and get atleast a draw from this game, otherwise we could drop fast. We needed 6 minutes in the 2nd half before we made our first goal. The rest of the game we were attacking and we finally got rewarded in the 75th minute. We kept pushing forward and got a 3-2 only 4 minutes later. An incredible comeback showing our bounce-back ability. 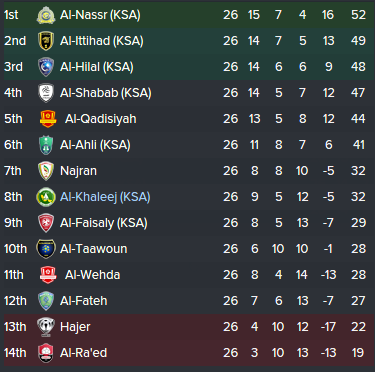 After this great result we got two very difficult matches: Away at Al-Hilal and Home against Al-Ahli. 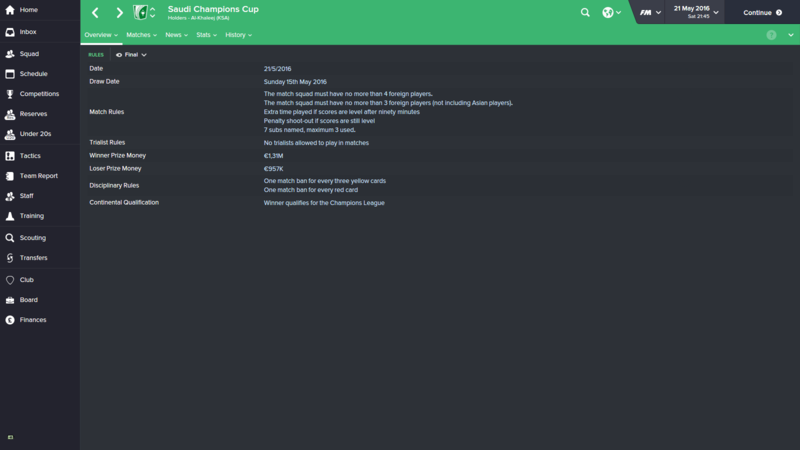 At this time we secured our place in the Pro League next year and played for a bit of prize money. The Al-Hilal match was very boring in which we got dominated but got lucky with a very fast goal. Al-Ahli was completely different. Going in the match with a different mindset we had to try and grab a win. Starting strong we managed to get a very fast goal. Al-Ahli fought back immediately and started attacking more, which resulted in an equalizer. After the 1-1 the game was even until Marawn Hussein made his second of the game just before half time. Halfway through the 2nd half was Amoroso able to seal the deal with the 3-1. Amoroso was always dangerous from that right side. Even though not scoring a lot or assisting a lot he was always able to get the ball to a teammate. It was not just my opinion, but also the opinion of the game itself averaging a 7.12 in the competition and a 7.28 overall. In the earlier update i showed you the end of the competition, but inbetween we've participated in the Saudi Arabian Champions Cup. The Champions Cup is one of two cups in Saudi Arabia. 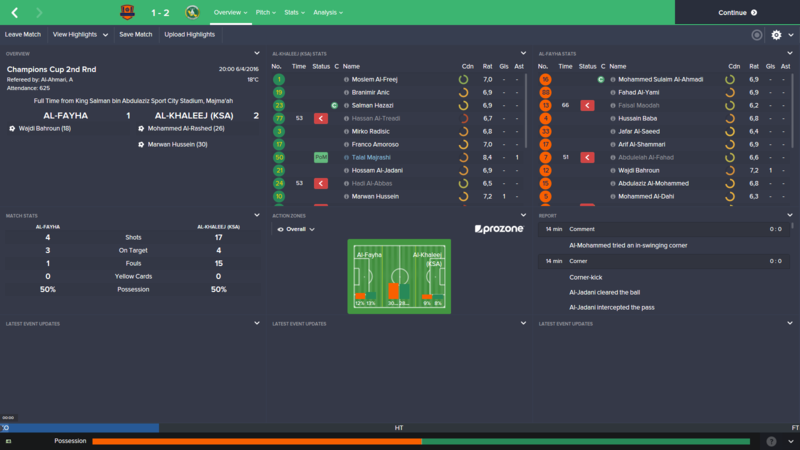 We were not good at the day against 2nd tier Al-Ta'ee. They fought for everything, while we weren't doing a good job fighting. Luckily for us we were the coolest on penalties. A rarity for us, winning away and winning with a margain of 2 goals and this was against one of the stronger teams. Two goals of Hussein helped us along the way. One word need: Goalfest. Very good to see us score 5 against such a talented side, but the 3 goals against us worry me. A very important match for us, getting some silverware is always great, but the 1.3 mil in prize money might even be better. There is also a place in the qualifying rounds of the Champions League up for grabs. 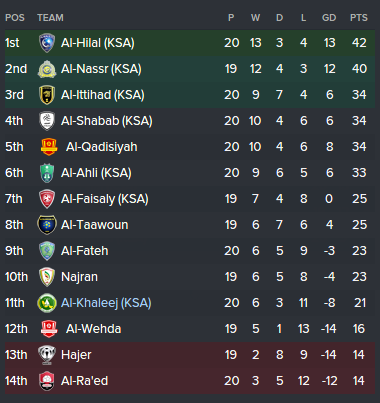 (Which we would get whatever the result is since Al-Hilal placed 3rd). The game wasn't as spectacular as the AL-Shabab game. We set up to attack while AL-Hilal wanted to dominate. 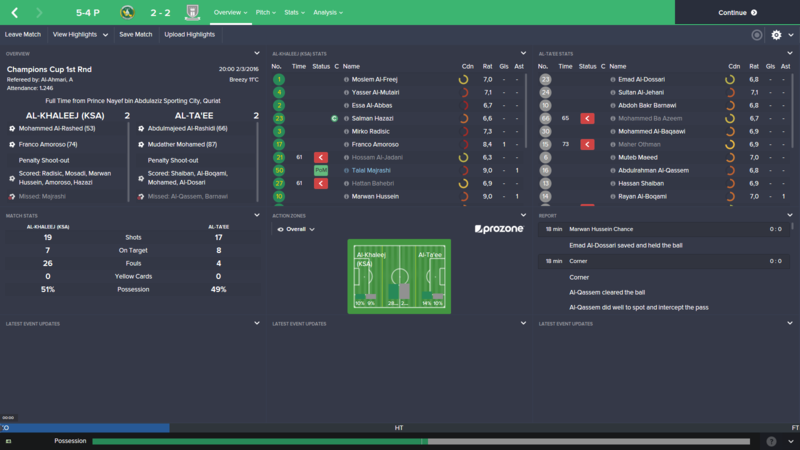 We were the better team at the start, resulting in the first goal from PoTS Amoroso. We weren't able to enjoy the lead for long as Al-Hilal striker AL-Muwashad finished a counter. It would stay 1-1 for a long time until substitute Al-Turki scored the 2-1 for me. Al-Hilal tried to look for another goal but didnt find it. This made us the winner of the Champions Cup. Just caught up on this story mate, looking really good so far! Congrats on the silverware hopefully it is the first piece of many to come! 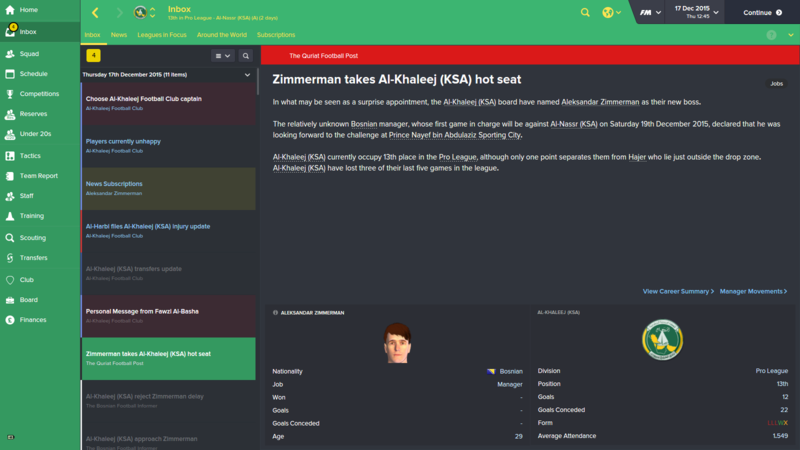 You are reading "Aleksandar Zimmerman: World-beater".